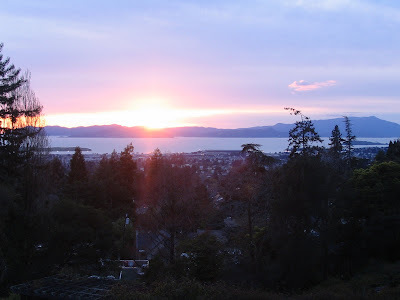 Life-giving, replenishing rains, coming none too soon on the heels of the third driest January on record, have drenched the long-parched Bay Area, courtesy of a series of Pacific Rim storm systems in February and March that brought great relief with over eight inches soaking Marin County foothills. Thankfully, the badly needed precipitation fell in a steady absorption pattern instead of all at once, an all too typical California storm scenario which would have created hazardous flood and mudslide conditions. 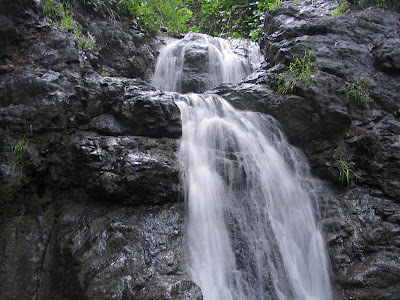 Instead, the rains have endowed the earthly hills with wellsprings of gradually released water to bring streams, tributaries and freshets roaring back to life as well as enabling reservoirs to inch back up to respectable capacity levels from drought-stricken lows. 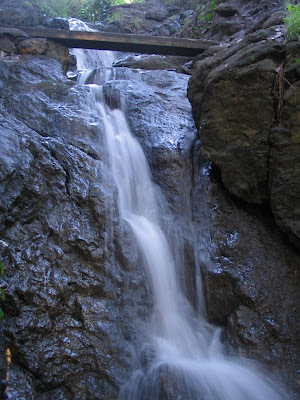 What better way to set the stage for a beautiful waterfall and bountiful wildflower-strewn season? 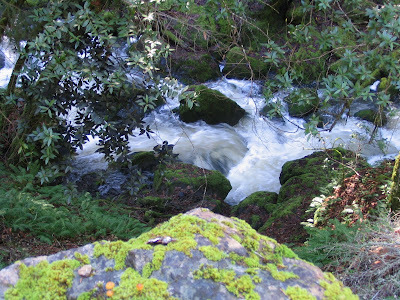 Nowhere is the spectacle of running water – the transformation from trickles or dry bedro ck to gushing run-off - more powerful and flat-out remarkable than at Lagunitas Creek, just below the spillway dam at pretty Lake Alpine, where brownish water turns snow white as it crashes over stepped ledges 50 ft. high to begin a riparian journey through a boulder-choked section of wild and scenic creek that twists and turns for two miles until waylaid by draining into Kent Lake and then released on the other end at Peter's Dam spillway to continue its free flowing course through Samuel P. Taylor State Park and eventually to its terminus drainage point into Tomales Bay wetlands. 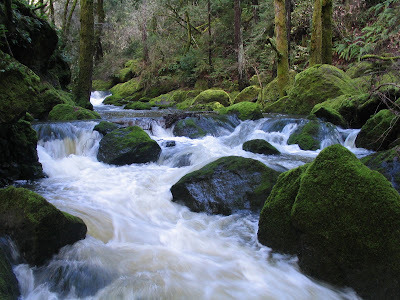 Along the way, the 20+ mile long creek – fed by tributary streams such as Nicasio, San Geronimo, Olema, Devil's Gu lch and Deadman's Gulch Creeks -- drains the hill country surrounding the West Marin communities of Woodacre, Forest Knolls, Lagunitas, and Pt. Reyes Station, covering an area of over 100 square miles. 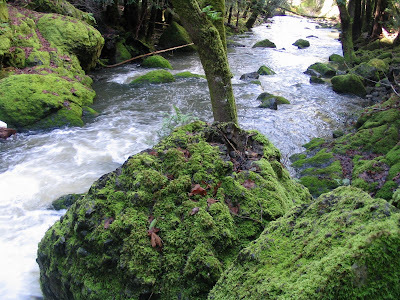 The watershed, perhaps Marin’s largest, provides ancestral home and hearth to redwood trees, newts, and coho and steelhead salmon who find their way upstream and into birthing tributaries by a near magical sense of what fish biologists call olfactory conditioning. 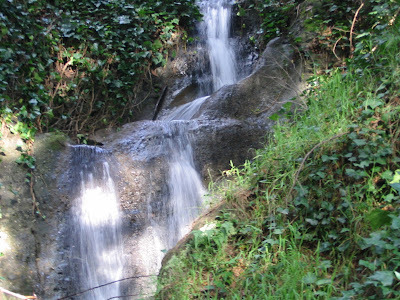 In the very upper stretches, the creek originates out of Alpine Lake's impounded waters, fed from several classic ravine tributaries born on the northern flanks of Mt. 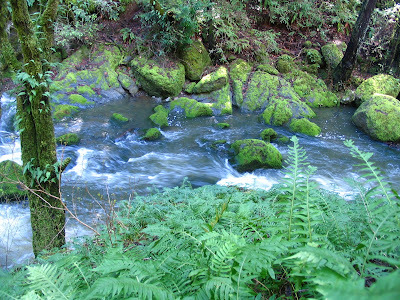 Tamalpais - including the East Fork of Lagunitas Creek, Van Wyck and Swede George Creeks. 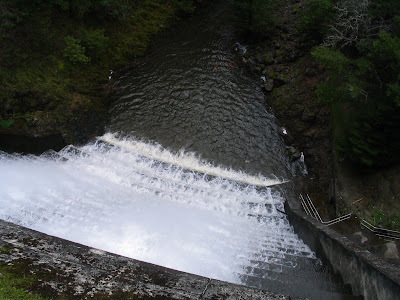 Here, below the spillway, looking down from the trail about 50 ft. up, you get an eyeful of the raw force and jaw-dropping beauty of the swollen creek. 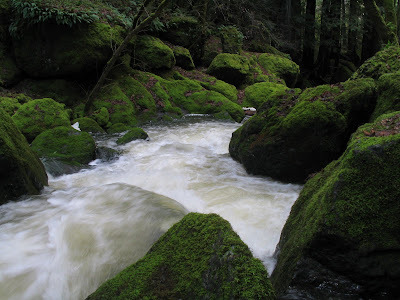 An Aussie we met called it "the river" – at this time of year, it truly invites comparison to a much wetter Cascade Range temperate rainforest climate where snow melt and run-off create major tumultuous flows. 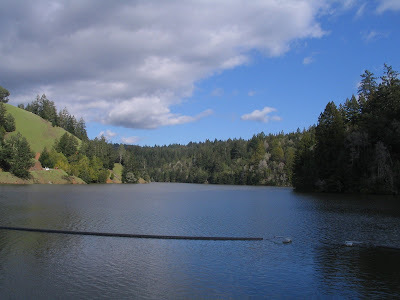 Inevitably, the desire to see what's beyond the next curve in the road leads us out of the sheltered nooks and crannies and into more open country through sun-splotched and boulder-lined patches of trail winding through redwood groves and oak, bay and madrone forests, replete with sensuous earthy aro mas, ferns galore, puddles with swimming newts, and sideshow freshets gushing down from hillsides which spawn plenty of leisurely occasions to stop, gawk, picnic and generally while away the sunny day marveling at the wilderness-like setting and paucity of human beings in our presence. We finally make it past Old Vee Road, and, the allure of Carson Falls notwithstanding, we decide to turn around and head back, making it about a six mile out 'n back. All in all, a soul-satisfying, good work-out and not a bad adventure to boot. Along the way back , we revel in the splendid isolation and moist lushness of the relatively untouched forest - how many people didn't we see? 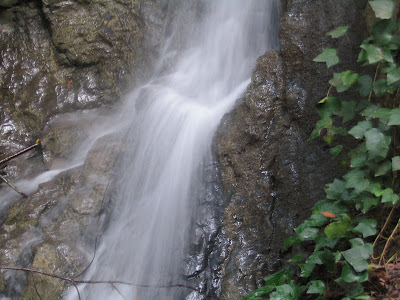 – and appreciate the extensive views opening up of Bolinas Ridge, looking rugged and majestic, with teaser glimpses far down into the canyon of Lagunitas Creek. Our imaginations strain to visualize what this place must have been like in pristine times – maybe like a mini-Alaska - when the salmon ran free and plenty, when the grizzly came to the shoreline to catch and eat them, when bald eagles and condors roamed the skies, and when native Miwok peoples, reigning supreme in harmonious consort with all creatures great and small, held their joyous ceremonies of renewal and rituals of supplication and propitiation each spring to celebrate the return of, not only life-giving rains, but sustenance borne from the tiny acorn and great inexhaustible runs of the salmon God. Barely catching my attention owing to a masterful camouflaging technique, I'm lucky to espy, right in front of me, tucked away on a tree branch protruding above a small brook burbling through Codornices Park in the city of Berkeley, a ruby-throated, green and turquoise feathered hummingbird roosting peacefully in a perfectly constructed, symmetrical nest, fashioned out of tiny bits of grass, mud, sticks and moss. Anna the Hummingbird is so completely at ease - in fact, zen motionless still - in her self-perceived invisibility that she is utterly unruffled by my nose practically sticking in her face to get a better look. 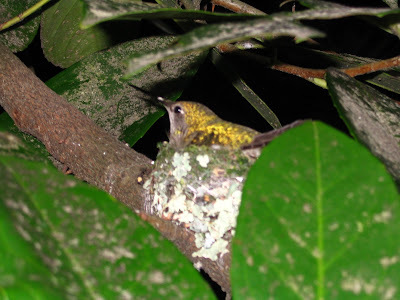 Finally, sensing intrusion and instinctual danger, she darts away and covers fifty feet in a split nanosecond to land on a higher tree branch, at which time I am able to peer into her nest to see two little oblong eggs, jewel-like in their preciousness and rarity, oddly reminding me of two pieces of Good and Plenty candies. The next day I return and - surprise of surprises - the re is a diminutive brood of two bumblebee-sized hatchlings. 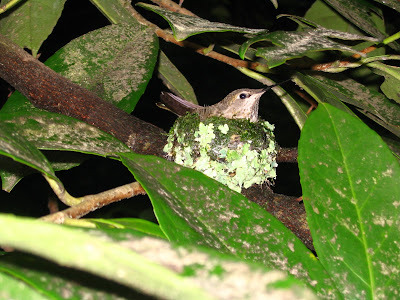 From my vantage point, I can barely discern a slight jerky movement of a living creature's head, the color and size of a tiny ripe blueberry, just below the lip of the nest - that newly hatched hummingbird can't be more than a half inch long! So fascinated and fixated am I on the hatchlings, that it takes a few seconds before I even notice Anna perched on the outer rim of the nest watching over things with a steadfast unblinking eye. I watch her, myself as zen motionless still as I can be, for seve ral minutes before she takes off again and disappears so quickly I can't track her movement. Her prolonged moments of perfect stillness versus her in-flight flurry of blurry but precise motion is an amazing contrast of opposite temperaments embodied in this little avian dynamo. This proud and protective Mother Hummer will preside over her brood for the next three weeks, until they make their first fledging attempts to fly away and carry on their genetically programmed destiny to pollinate, procreate, proliferate, and playfully ply the skies. 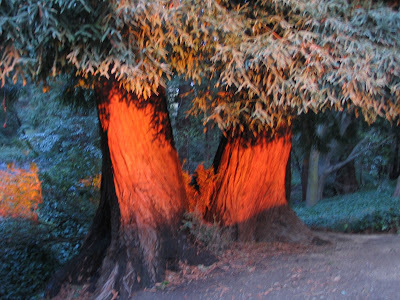 Being witness, up close and personal, to the natural world's inner workings, is a joyous and transformat ive experience, a bonk on the head reminder that you don't have to venture far afield to partake of the glorious pageantry of Mother Nature unfolding in undisturbed, timeless rhythms, however small or hidden. Codornices Park may be a small dot of green on a grid map of cross streets and avenues, but it packs tons of beauty in its confined sylvan and riparian quarters, with its dense stands of vegetation and tree cover, gardenesque rock outcrops, and, most notably, the conver gence of two forks of Codornices Creek tumbling down gullied hillsides originating from swales and springs in residential areas below Grizzly Peak Boulevard. 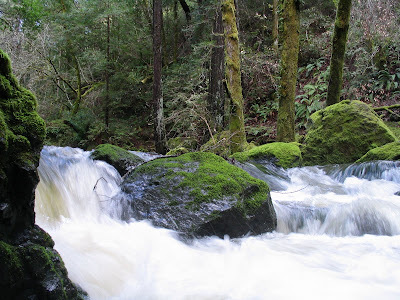 The upper Codornices watershed is 1.1 square miles of heavily urbanized settlement, and yet it produces an amazingly free-flowing creek, mostly out of culvert, that traverses 2.9 miles in a narrow winding ribbon to its Bay outlet. 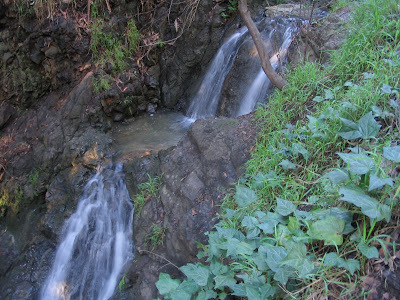 Typical of East Bay (and all Bay Area) semi-perennial streamlets, Codornices Creek flows sporadically throughout the year - turning torrential during winter rains, and drying to a near trickle in the summer. 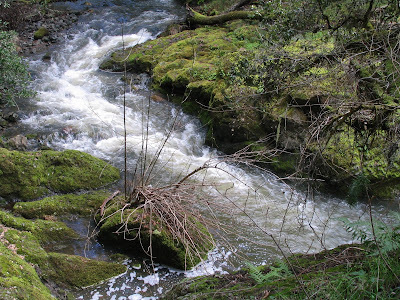 Becau se of this irregular pluvial pattern, the creek probably has not historically been a major spawning ground for Steelhead trout, although there have been recent documented sightings of Oncorhynchus mykiss endeavoring to establish spawning nests (redds) in its lower stretches. 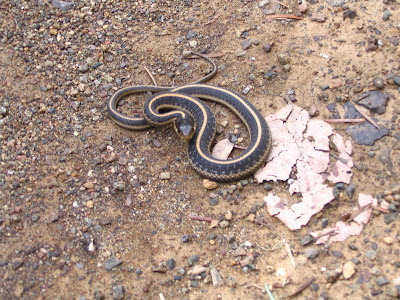 Even during drought stricken times, the stream preserves, 'neath shaded canopy, cool pools and trickling flows, to nurture a stream-rich habitat for city dwelling wild critters, "mean and lowly things" such as worms, crayfish, newts, salamanders, fish, snakes, and the occasional (threatened) red-legged frog, as well as refuge for larger mammals who come to browse, graze, drink and hun t - deer, fox, skunk, coyote and bobcat. 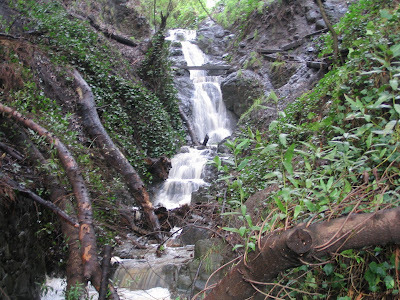 A thriving creekside plant community supports a variety of California native trees, including redwood, bay laurel, buckeye, big leaf maple, varieties of oak and remnant stands of willow thickets, with a lush understory of native flora, brambles, poison oak and seasonal wildflowers. 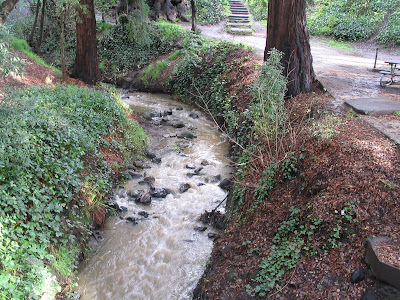 Through parks, neighborhoods and business and residential backyards, Codornices Creek flows through Berkeley and Albany pretty much as it always has; it remains only one of a handful of nearly a dozen primordial area creeks that sees the light of day on its meandering journey from hilltop, through flatlands, to its drainage system in the Bay. Owing to tireless efforts and mostly unheralded work of the Urban Creeks Council, their lofty mission to "preserve, protect and restore urban streams and their riparian habitats" for the benefit and integrity of whole ecosystems has really paid off in recent years, thanks to countless volunteers and lots of donat ed weekends helping to restore, clean up and set free more and more culverted stretches of East Bay creeks, so that you and I - and all our animal and plant friends - can enjoy their beauty and peaceful refuge for all time. 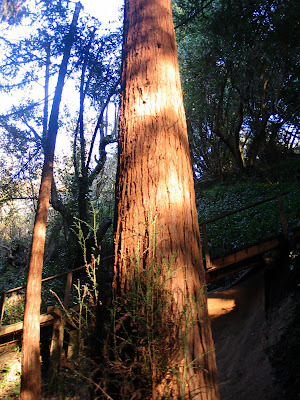 High in the Berkeley Hills, cutting small ravines in steep yards and woodsy lots harboring tall redwood trees, three stems of Codornices Creek rise, eventually merging to form the main stem. 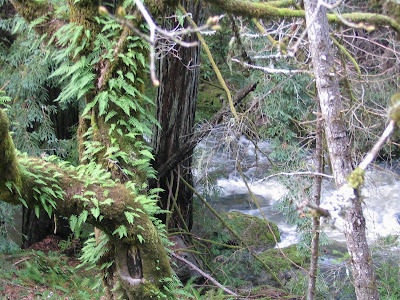 Along the middle fork, a literal walk in t he park, up a few flights of stairs, and through a little ivy-covered gate, you chance upon an incongruous scene which makes you wonder where you are. 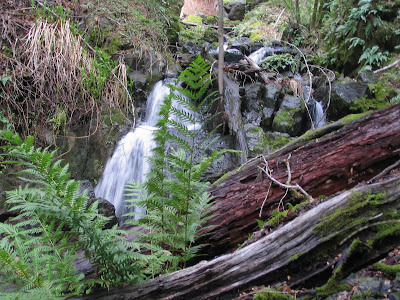 . . you're amazed at what's tucked away and hidden back in there. . .you're walking along the muddy path, through the forest, the sound of water getting louder and louder, and then you round a bend and come face to face with an impressive waterfall in a fern grotto, in a redwood fo rest canyon! 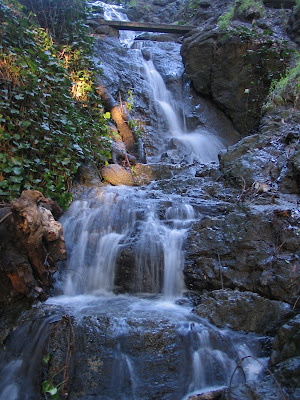 It's a sight to behold, a waterfall right in Berkeley! 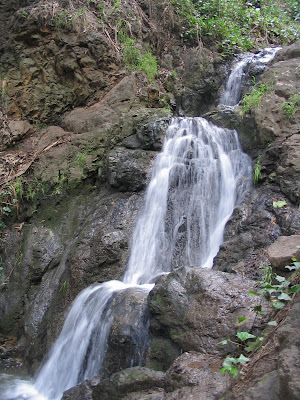 In over a dozen visits during the past few weeks, Benner Falls has become our new and special sanctuary, a get-away-from-it-all-in-fifteen-minutes place of sublime privacy we call going to "church". My k ind of priestless worship -- reverential silence, shrines of rotting logs and tree stumps, reliquary niches in rocks holding sacred secrets, founts of holy water, genuflecting pew of wood across the gulch, crosses of trees, communion with higher spirits, silent meditation and intimate confessionary moments, and God-beams of sunlight filtering through the arboreal steeple of redwood canopy. Here, your prayers are heard and answered.